While the ghosts build a resistance against Roman, Port Moore survivors draw straws in preparation for their final battle, a quest to connect the two halves of the artifact in the ghost realm. While Daphne gathers the power she needs to launch her accelerator test, civil unrest breaks out in town when Paolo refuses to open the bar, and a mob pursues Roman, Landis, Jimmy and the McGrath-Dufresnes. 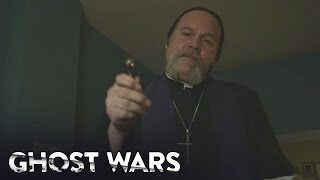 You are able to buy "Ghost Wars" on Apple iTunes, Google Play Movies, Amazon Video, Vudu, Microsoft Store as download.